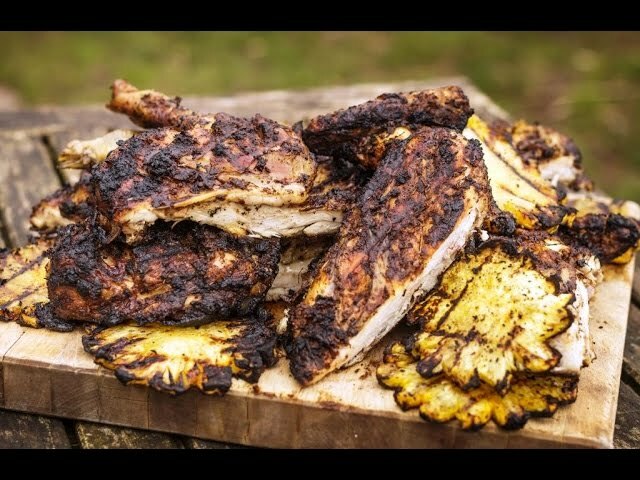 Genevieve Taylor - Spatchcocked jerk chicken with grilled pineappleGrilling a whole chicken can be tricky so in this recipe they are ‘spatchcocked’, which simply means flattening them out to a nice even sized layer. For maximum flavour from the jerk paste, marinate the birds the night before. Grill a spatchcocked chicken on a hot barbecue and you’ll never look at grilled meats the same again! Add a dose of rich, vibrant jerk seasoning in the mix and you’re on your way to something truly extraordinary! This is one of our favourite BBQ chicken recipes of all time and a guaranteed crowd-pleaser! For the biggest hit of flavour possible, be sure to marinate the chicken overnight to give the jerk paste sufficient time to really get down to business! Firstly you need to spatchcock the chickens – this simply means flattening them out. This is a great way to barbecue chicken as it means they cook quickly and evenly. Start with a bird breast side down on a chopping board and using heavy duty kitchen scissors cut down each side of the backbone. Remove and discard. Turn the bird breast side up and press really firmly down to open it out flat. Take a skewer and thread it diagonally through the chicken, from the wing to the thigh. Thread another skewer from the other wing through to the opposite thigh. This will keep the bird nice and flat as it cooks. Repeat with the other bird. To make the jerk spice rub, add the ginger, garlic, chillies and oil to a small mixing bowl and stir together. Add the allspice, cinnamon, paprika, thyme, sugar, salt and pepper and stir well to mix. Divide spice rub between the two spatchcocked chickens and rub all over. You may want to wear gloves for this as the Scotch bonnet chillies are mighty hot! Cover the chickens and leave to marinate in the fridge for 2 hours, or preferably overnight. When you are ready to cook, fire up the barbecue to a low heat, this will only take a couple of minutes. Lay the spatchcocked birds skin side up on the grill bars and shut the lid. Leave to cook for 40 minutes. Check every 10 minutes or so to make sure the chicken is cooking evenly, turning it around if necessary but keeping skin side up at this stage. Whilst the chicken is cooking, prepare the pineapple for grilling. Use a large sharp knife to chop off the top and bottom on the pineapple. Lay the pineapple, flat bottom down to keep it stable, and slice down in thin strips to remove the peel, cutting just a few millimetres of skin off. The sweetest flesh is just below the skin so you don’t want to waste it! The pineapple will now be left with a load of unsightly brown eyes that don’t want to eat. If you look closely you can see that the eyes are in spiral lines running diagonally around the pineapple. Turn the pineapple onto its side, take a small sharp knife and cut a V shaped trench down either side of a row of eyes, removing the row in one piece. Rotate the pineapple a little and move onto the next row. Repeat until all the eyes are removed. Cut into 1cm thick slices, and brush all over with a little oil and season with salt and pepper. Once the chickens have been on the low heat for 40 minutes, flip them over skin side down and allow to crisp up and finish cooking through for another 20 minutes over a low heat. Resting a heavy pan on top will press them down – maximum contact of skin to the grill ensuring maximum crispness. When the chicken is about 10 minutes from being done, it’s time to cook the pineapples. Fire up the other side of the barbecue to maximum and let it get hot for a few minutes. Once hot, lay the pineapple slices onto the grill bars and cook for a few minutes each side until soft and lightly charred in places. To serve, chop the chicken into pieces, and serve with the pineapple slices on the side.